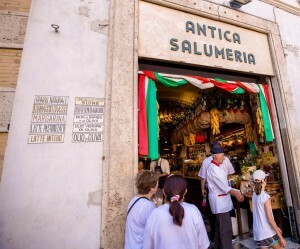 In mid July I had the good fortune of a trip to Italy, Rome to be exact. I was on my way to visit Abruzzo and learn about pasta and olive oil, but first I needed a few days in Rome to see the sights, visit great food shops, and spend a day at I Buonatavola Sini to learn about Pecorino Romano cheese. Pecorino Romano is a traditional sheep milk cheese from Lazio; it’s name literally means sheep cheese of Rome. Historically, Pecorino Romano is said to have fueled the slaves and soldiers who built the Roman Empire. It’s protein rich, and salty as all get out; which after spending a sweat soaked week in the Roman heat I can clearly understand it’s salt replenishing quality. So on a Tuesday morning, my hosts, Claudia and Claudio (you can’t make this stuff up) picked me up at the Campo de Fiori and drove my out to the factory. Claudia is a friend of the family, a college student studying finance in Rome and our translator for the day; and Claudio was our driver, plant manager, and the guy who made sure I ate everything on my plate. 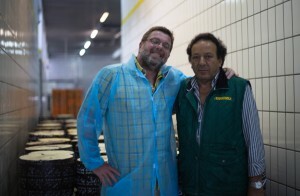 At the factory I was greeted by owner, Giuseppe “Peppe” Capuani, who previously worked at Fulvi for decades coming up the ranks and finally taking over operations recently. I Buonatavola Sini is located in Nepi, in an unassuming building along the side of the highway about 40 minutes outside of Rome. 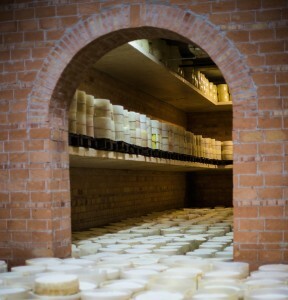 There, dozens of workers turn out thousands of wheels of this sturdy workhorse cheese. I noticed hundreds of wheels in every direction, stacked into tight corners of the facility, and was told they keep about 1500 wheels in production at this time of the year. Fulvi has been making cheese for millennia, and in 1957 set up shop in the current location. Along the way they merged with the Sini family who produced their milk, and when I started purchasing their cheese back in the ‘90’s we called it Sini-Fulvi. 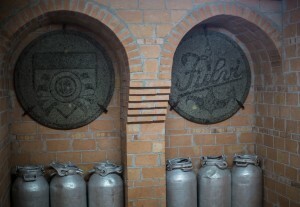 The company is now known as I Buonatavola Sini but the original name is kept for the cheese – Fulvi. Fulvi is the most traditional of all Pecorino Romano, made exclusively with the fresh sheep milk of Lazio. 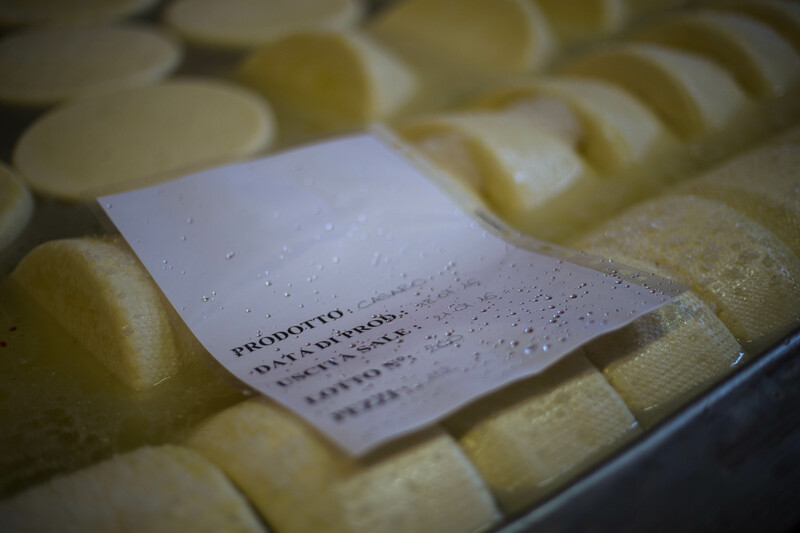 In fact, 70% of all sheep milk produced in Lazio makes it way to Sini to be made into fresh Ricotta de Pecora (sublime), semi-firm Caciotta style cheeses, a firm natural rind Pecorino known as Artigiano, and of course, Pecorino Romano. 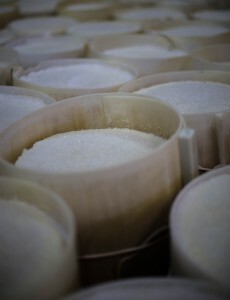 Pecorino Romano is a DOP (Denominazione di Origine Protetta – literally “Protected Designation of Origin”) cheese, establishing its geographical and historical importance alongside rules of production. Much like France’s Roquefort which allows sheep milk from Corsica in its production, the rules for Pecorino Romano allow the cheese to be made in Sardinia in an effort to provide income to that Island’s economy. Of note – Fulvi is the only producer of Pecorino Romano in Lazio, and proudly promotes their cheese as “Genuine Fulvi, Pecorino Romano del Lazio DOP”. 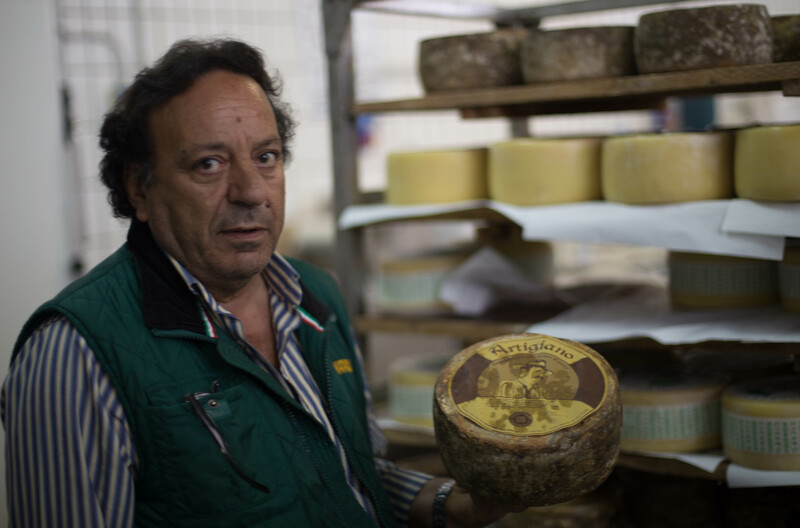 As little as 40 years ago there were dozens of producers of Pecorino Romano in Lazio, but production has moved to Sardinia where costs are lower. Most Sardinian Pecorino Romano is sold for use in industrial preparation for cheap packaged foods, and corporate controlled restaurants and retailers. 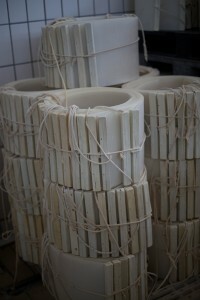 Each 50-odd pound wheel is squeezed into a cylinder that’s drawn tight by a rope, expelling excess moisture. 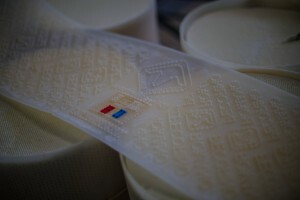 A dot-matrix band displaying the Pecorino Romano DOP markings of authenticity is pressed between the curd and outer cylinder making a permanent impression on the exterior of the cheese. 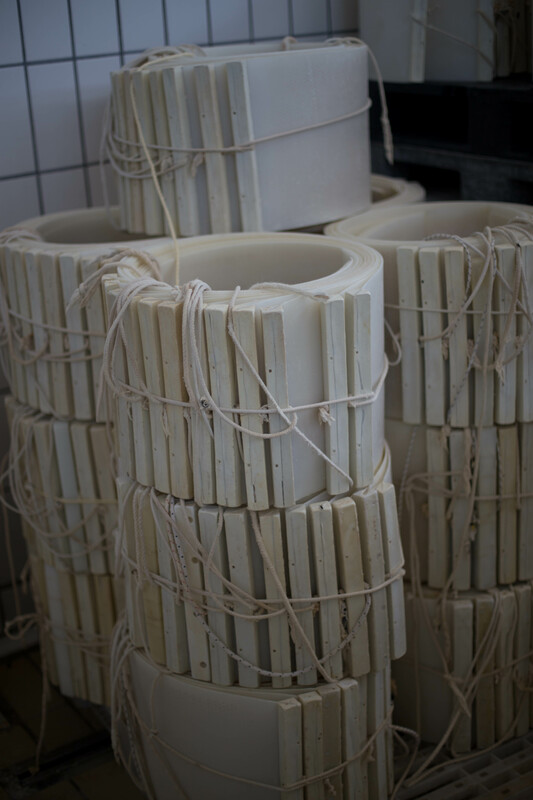 The wheels are generously salted and placed on racks to drain. 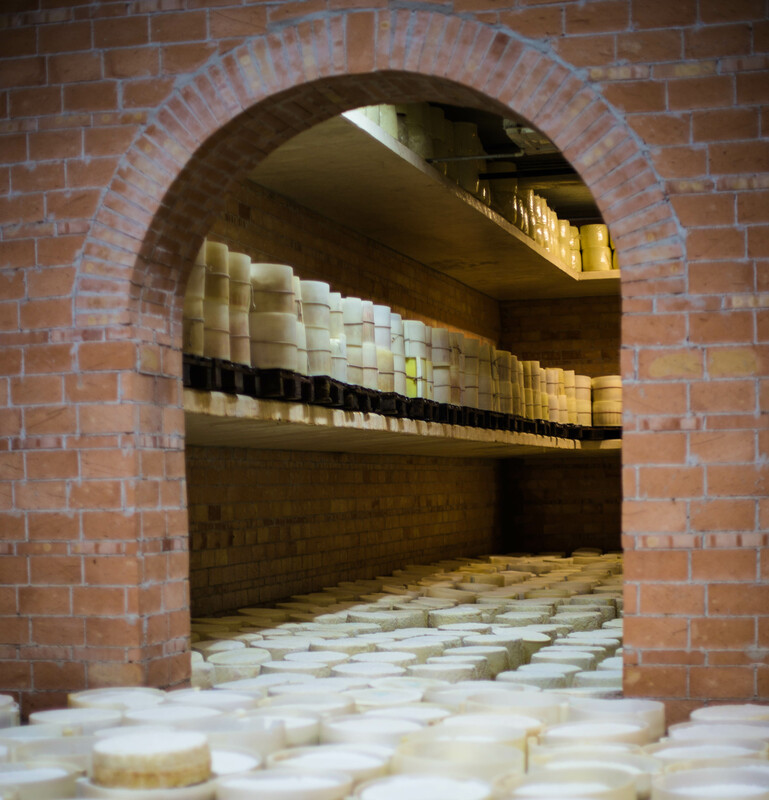 For the next 3 months or so the cheese is turned and salted repeatedly (it takes a long time for the salt to be absorbed throughout the paste of the cheese) before being vacuum sealed to lock in moisture, and aged another 4 months or longer. 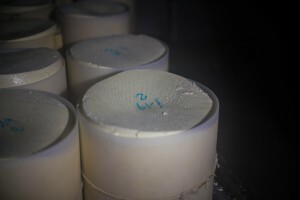 Once ready for market, the vacuum seal is removed, the cheese is cleaned, and a thin black waxy band is applied to the exterior of the cheese. This too is traditional, or at least mimics tradition. Back in the day, cheeses like Pecorino Romano and Parmigiano Reggiano were “cooked” over an open wood fire in a cauldron. When the curd was removed from the cauldron and pressed into it’s final form, the black ash from the wood was rubbed off the cauldron and onto the cheese to provide protection from insects and from oxidation from cracks that develop on the surface of the cheese as it matures. We were too late to see the actual “make” of the cheese. It was just past noon, and the plant was abuzz with the details of a caseificio (cheese factory) – cleaning, cleaning, and more cleaning, turning the cheeses to keep the moisture and butterfat from pooling on the bottom of the cheeses, packaging, and loading the trucks destined for trattorias and food shops near and far. After the tour my hosts drove us to a lovely lake not too far from the caseificio, Lago di Bracciano, for lunch where we tasted through their line of cheeses while overlooking the water. 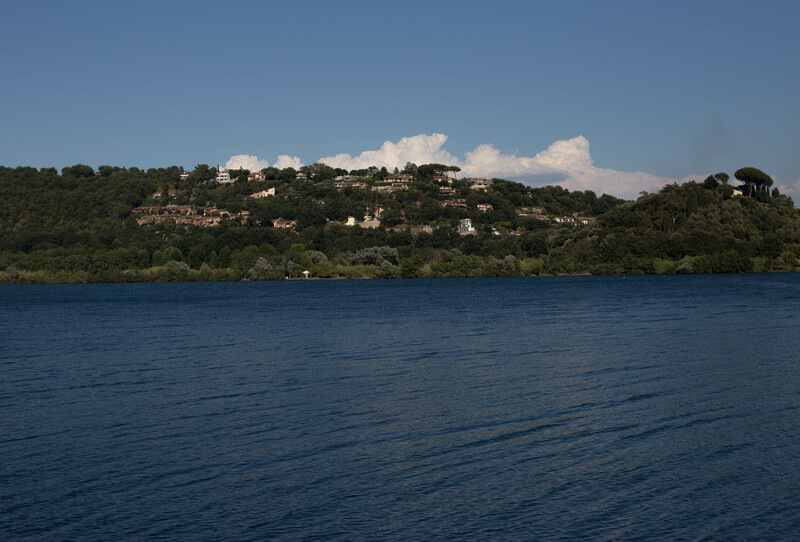 And this is where they get you with all that Italian romance and charm… A picturesque setting with the breeze from the lake cooling your back from the summer heat, a tasting of cheese, and a little more cheese because you’re the cheese man from San Francisco. 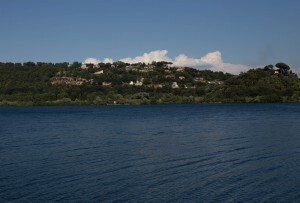 Then comes the pasta, or more accurately the pastas (fresh Gnocchetti with meat sauce and Tonnarelli with mussels and clams), followed by fried fish plucked from the lake, and how about another bottle of wine? Fresh summer vegetables adorned with olive oil, and the best fried potatoes of your life. Hey, you didn’t eat all the pasta and clams; you should have some more. And on and on through a pack of smokes (not me), bowls of ice cold peaches in sweet wine (me, for sure! ), a bottle of Amaro (guilty as charged), and the inevitable conversations about Donald and Hillary and the comparisons of our cultures, foods, business, and politics. Their hook is set, and my love for Fulvi Pecorino Romano, their US importer Michele at Forever Cheese who made this all happen, and the ways of the Italian lifestyle are mine for life. This article was written on 24 Aug 2016, and is filed under Cheese, Italy, Rome, Travel. © 2016 All Things Delicious. All Rights Reserved.